Reverse logistics is defined as the practices and processes set up for organising product returns from points-of-sales to the manufacturer in order to repair, recycle or dispose of these articles in the most cost-effective way. The upsurge in e-commerce business has had a direct impact on logistics and has forced companies to update their processes and strategies to stay competitive. In the case of reverse logistics, customers purchase items online and are the ones who return them directly to the source. Corporate: the reverse logistics of returns management means dealing with the increase in returns that businesses incur in their stock levels. Ecological: one of the aims of reverse logistics is to minimise the environmental footprint of doing business. In this respect, businesses develop products and processes that, at the outset, are eco-friendlier. The customer is unhappy with the product because it is not what they were looking for or what they expected. The product is faulty or defective. The item is obsolete and has outlived its serviceability. Overstock that must be returned to the warehouse installation. This stock is vital for the running of a business, although they are just used in specific occasions. Seasonal stock, in other words, products that are only sold during certain time periods (like seasonal wear or toys during Christmas) and that must be stored the rest of the year. Returns entail shipping and received goods must be sorted according to their SKU and condition. This has repercussions on staffing hours, the extra space needed to do this work and means higher associated costs. Companies need a solution that suits them when it comes to dealing with returns. For example, enabling a specific warehouse zone or a warehouse exclusively for returns. In any event, setting up a warehouse management software (WMS) is the key. The WMS must be capable of managing reverse logistics without stopping other warehouse operations. 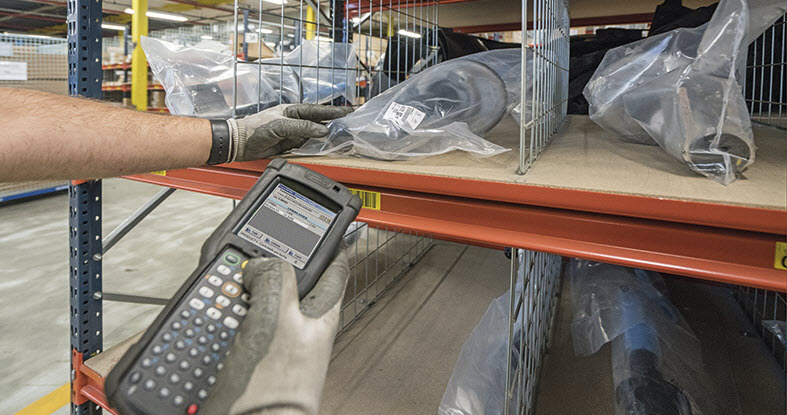 Easy WMS, the warehouse management system developed by Mecalux, includes a returns receipt option, specifically tasked with organising the returns and identifying their origins. Once the returns are received in the warehouse, operators must take a close look at the items and ascertain the reason for their return. Moreover, they must check if the article can be resold or if it needs repairing or refurbishing. Keeping the condition and characteristics of the products in mind, the WMS assigns the goods a destination. The system can create orders to store the products in specific warehouse locations or send them to be repaired, if need be. Companies must cut down on returns by boosting sales, which, likewise, helps to give a strategic advantage over the competition. One possibility is to increase product discounts, run promos more often and keep stock up-to-date with new, eye-catching deals so that consumers do not need to return products and are fully satisfied with their purchases. Another option consists of establishing a short trial period during which the customer can return the product if it is not to their liking. That said, once this time is up, returns would not be accepted. To lower costs due to returns, first of all, companies must carry out a business analysis that helps pinpoint the areas that need improvement. Typically, enterprises with a higher rate of returned items focus more energy on bettering reverse logistics. Product life management. Items go through different phases (introduction, growth, maturity and decline) and each one of these requires an individual approach to management. Information technology systems. These provide real-time tracking of the products. Automated data collection about reverse product flows and processing these data are pivotal in the development of efficient management of this chain. There is a close connection between reverse logistics and environmental protection. It focuses on managing the products, components and materials that have been used and discarded and of which the manufacturer bears some sort of responsibility. Its objective is to reuse these products and, where possible, reduce the final amount of waste. Working with scrapped products stops fresh raw materials from having to be used to manufacture new items. This results in a direct reduction of manufacturing overhead, as well as less power usage and lower levels of air and water contamination. For reverse logistics to be as efficient as possible, it is also fundamental to involve the consumer. Businesses are responsible for being part of this process, for example, by creating campaigns that promote and encourage the active role of the people in a community in recycling. Repair: get broken products back into working order. Refurbish: bring used products up to a specified quality (generally less than the original). Remanufacture: bring used products up to quality standards that are as rigorous as those of new products, although at a lower cost. Cannibalise: recover a small number of reusable parts and allocate them to repair, refurbish or remanufacture other items. Recycle: reuse materials or components from discarded products to make new items, which might not necessarily be like the original article. Minimise the environmental impact. Reuse of materials in manufacturing processes helps stave off the misuse of unprocessed raw materials and requires less power. This practice will directly benefit society as a whole. Improve corporate image and customer satisfaction. There are significant competitive benefits for businesses using reverse logistics. More and more customers are interested in doing business with companies who are committed to environmental issues. Discover new ways of reworking materials. Recouping the monetary value of items that were rejected can open up new business opportunities. Outlets are a prime example, specialising in selling last season’s products or those with small flaws at a lower than usual prices. Stock control. Reverse logistics means better stock organisation, which stops the housing of obsolete products and minimises possible errors. All these advantages have a positive effect, likewise, on cutting costs and boosting revenue. Reverse logistics is becoming more relevant throughout the business world. Even though these practices contribute to a cleaner environment, they are also a clear business opportunity thanks to savings from salvaged products. In any case, companies should put together an in-depth study of their needs and objectives to find a returns management solution that works for them.